Welcome to the EthicsWeb Bookstore! Posted August 2, 2010 by Chris MacDonald in Books that matter..... Comments Off on Welcome to the EthicsWeb Bookstore! Click on one of the links above to find books in the category of your choice. Ethics is the careful study of right and wrong. None of the books featured here will give you easy answers to hard questions. But the best of them will help you to explore complicated issues more carefully, and to assure that you’ve looked at such issues from every angle. This “bookstore” doesn’t aim to be comprehensive. 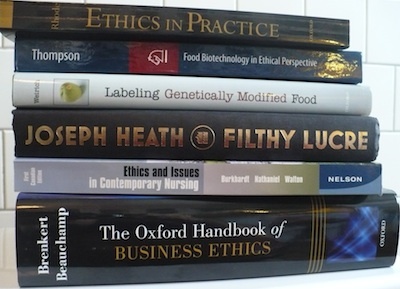 There are thousands of books on ethics out there, and I’ve listed only a few of them. My aim is to provide a small selection of high-quality books so that newcomers to the topic can select a book with some degree of assurance. If you have questions, let me know.